Nathan Allotey and Justin Jackson have a candid conversation about how to be successful a creator, entrepreneurship and the state of creating online courses while building a community. 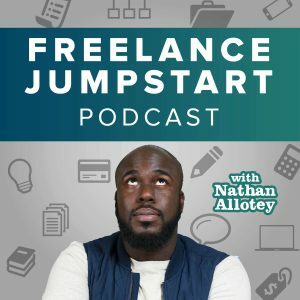 This episode of Freelance Jumpstart was inspired by an article and accompanying twitter conversation between myself and Justin Jackson. Tara Gentile, entrepreneur, and small business educator wrote an article titled, “The Democratization of Education Online.” which highlighted a significant shift occurring in the world of small business education, coaching, and training. The time period of empty promises of courses that will help entrepreneurs make six figures is over. The shift is moving toward building a community with personal attention. For today’s entrepreneurs, the difference between success and failure will be your commitment to investing in your audience. In today’s creative space communities have been reduced to dormant slack channels filled with advertisements of the creator’s new thing. Justin started an online community called JFDI which evolved into Product People Club which is currently Mega Maker Club. Justin engaged with his community so often for many members it’s the most active community they’ve been a part of on the internet. We frequently create communities because we believe they have value, however, what makes a community valuable is your willingness to engage people, create conversation, and be genuinely interested in what other people are creating. Many times as creators there is a desire to get to the point where you are a full-time solopreneur. Though this is a great goal, the danger is you can often forget how it felt at the beginning of your journey. There’s an advantage in a certain level of relatability when you are in the trenches of working a full-time job while trying to transition to full-time. You are fully aware of the daily motivation, fears, and frustration of trying to balance your dream job with your current reality. It is during this time and in this pain where you have your greatest marketing tool. Don’t be too quick to forget this time period. There seems to be an epidemic of online entrepreneurs who get successful through a series of fortunate events (myself included) and then look back and rationalize their achievements as smart and strategic planning on their part. This begs the question of is someone really teaching skills that are useful or is there success heavily based on the fact that they arrived early to the party? The just in time learning movement is still here however it is time for a shift. Producing PDFs, online courses, and other info products are still relevant however we cannot limit ourselves to creating these assets. Just because info products are easier for creators to produce, it doesn’t mean this is the best course of action. We have to think about what is best for the audience that we serve. When 37signals built their flagship product Basecamp, it was to serve their customer base. However, when others companies observed the success of Basecamp, it led to many software-as-a-service companies building applications based on Ruby on Rails because they wanted to recreate the recurring Revenue structure 37signals was able to capture it with their product. This same mindset is prevalent amongst online creators. There is a progression of client work which graduates to consulting or coaching then it raises to an online course or info product then it progresses to the ultimate level of a software-as-a-service for recurring revenue. This makes sense because it is scalable and allows you to earn more income with your time however some creators try to force the end result of recurring revenue through an online course or product. There’s a temptation to fall in love with the medium rather than the customer. When Justin released Tiny Marketing Wins he fell in love with the concept of recurring revenue. Justin decided to offer the product as an annual fee only to discover that his customer base did not find value in paying yearly for marketing tips but wanted all the tips at once and the ability to go through those tips at their own pace. Justin had a great product, but he tried to force a recurring revenue model on his audience when a model of flat-rate pricing was best. The vessel in which you use to reach people, and online course or info product is not as important as the message you are looking to communicate to your audience. The only way you are going to truly discover what that message is is to go where your potential customers are and listen to them, engage in dialogue, and do more research than you ever have to uncover what they really need and want. Seeing how Nathan Berry runs ConvertKit is an excellent example of a success story of a creator who started freelancing then they transition to products and finally to a software-as-a-service. When Nathan first began ConvertKit, he asked me personally to sign up for the service. At the time ConvertKit was new and wasn’t a good fit for me, but we continue to stay in touch. Currently, I am an active customer of ConvertKit, and in addition to the previous product, I purchased from Nathan he has ConvertKit has received hundreds of dollars from me. Why? Because growth tactics can only get you so far. The primary differentiator which transformed me into a customer of ConvertKit was the fact that he personally reached out to me. No matter how many books I read about growth tactics the one thing that has stood the test of time is personal touch. Quit putting so much effort into faking human interaction and have actual human interaction. It’s not about us it’s about them. If you’re asking yourself, who is the “them” we speak of? Now you are on the right track. As an online Creator, entrepreneur, business owner, course creator, the primary motivation for what you do cannot be money alone. The primary motivation has to be your audience. If you have any type of business, you are in the customer service business. Though there are different ways to serve your audience be honest with yourself and ask are you seeking to serve them at all or did you create an audience, so the audience serves your purposes.